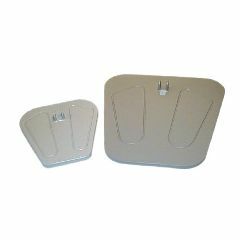 AllegroMedical.com presents The Baseline® Back-Leg-Chest & Mmt Accessory - Oversize Lifting Platform. The Baseline® back leg and chest dynamometer and cable tensiometer is perfect for muscle strength measurement, job task analysis and functional capacity evaluation (FCE). The unit can be used to measure strength of muscles of the back, leg and chest. The measurement base provides secure footing. Chain length is adjusted to accommodate for height differences or to vary the point of force application. Maximum reading remains until the unit is reset. The strength reading can be viewed as pounds or kilograms. CE Certified. Comes in a protective carrying case. Lifting platform includes large 24 x 24" trapezoidal shape platform base, 5’ chain, 1 snap oval connector, and 1 threaded oval connector.